Karaite teacher of the ninth or tenth century. According to Sahl ben Maẓliaḥ (see Pinsker, "Liḳḳuṭe Ḳadmoniyyot," p. 37), Ḥasan publicly disputed with Saadia, and after Saadia's death wrote against him. In opposition to this, Ibn al-Hiti records that Ḥasan lived in Bagdad, and held disputes there with the Christian physician Abu Ali Isa ibn Zara (see Steinschneider, "Polemische und Apologetische Litteratur," p. 146), who wrote in the year 387 A.H. (= 997 C.E.). This date is, however, far too late for Ben Mashiaḥ. Of Ḥasan's polemic against Saadia, which was probably written in Arabic, a passage is extant, referring to the antiquity of the present Jewish calendar (the well-known theory of Saadia). In this passage mention is made of certain "Sadducaic writings," which, as is now known, circulated among the Karaites of the tenth century. 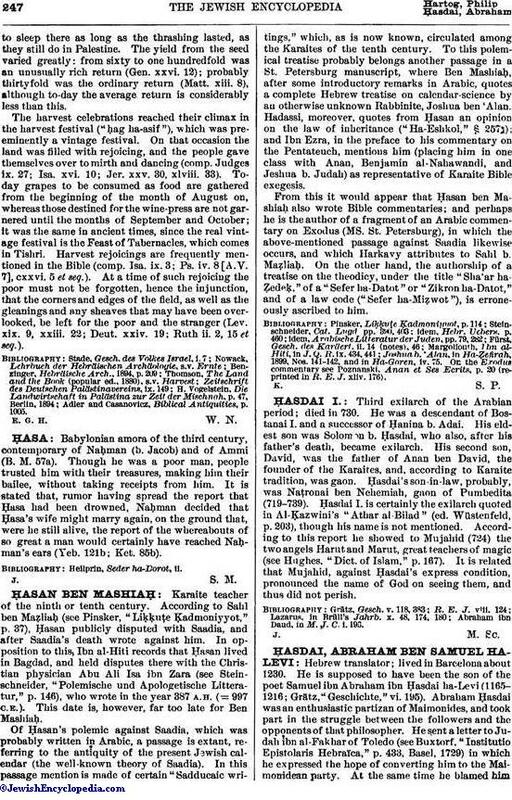 To this polem-, ical treatise probably belongs another passage in a St. Petersburg manuscript, where Ben Mashiaḥ, after some introductory remarks in Arabic, quotes a complete Hebrew treatise on calendar-science by an otherwise unknown Rabbinite, Joshua ben 'Alan. Hadassi, moreover, quotes from Ḥasan an opinion on the law of inheritance ("Ha-Eshkol," § 257ג); and Ibn Ezra, in the preface to his commentary on the Pentateuch, mentions him (placing him in one class with Anan, Benjamin al-Nahawandi, and Jeshua b. Judah) as representative of Karaite Bible exegesis. From this it would appear that Ḥasan ben Mashiaḥ also wrote Bible commentaries; and perhaps he is the author of a fragment of an Arabic commentary on Exodus (MS. St. Petersburg), in which the above-mentioned passage against Saadia likewise occurs, and which Harkavy attributes to Sahl b. Maẓliaḥ. On the other hand, the authorship of a treatise on the theodicy, under the title "Sha'ar ha-Ẓedeḳ," of a "Sefer ha-Datot" or "Zikron ha-Datot," and of a law code ("Sefer ha-Miẓwot"), is erroneously ascribed to him. Joshuab. 'Alan, in Ha-Ẓefirah, 1899. Nos. 141-142, and in Ha-Goren, iv. 75. On the Erodus commentary see Poznanski, Anan et Ses Ecrits, p. 20 (reprinted in R. E. J. xliv. 176).